Louisville Metro Healthy Start has added a new event for recognition of the families served by having its First Birthday Party on April 24, 2013. Healthy Start recognizes that often families do not remain in the program following the child’s first birthday. For this reason Louisville Metro Healthy Start took the opportunity to provide health education message on early childhood development during a celebratory birthday party reception. Graduation ceremonies are held at or near the child’s second birthday. 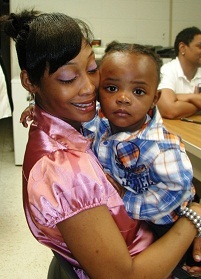 LaDasha Downs, a mother of three, said the program helped her get Pampers for her 1-year-old baby, D’zarion Downs.